The Fifteen Days of Miracles — from the first day of the Tibetan new year (Losar, February 5) until the fifteenth (February 19) — commemorate the special time when Guru Shakyamuni Buddha showed miraculous powers in order to subdue six Tirthika, or non-Buddhist teachers, who lacked faith in him, and to inspire more faith in his followers. It culminates on the full moon, the fifteenth day of the lunar calendar, which is the actual day of Chötrul Düchen. The Fifteen Days of Miracles are also a time for pilgrimage and intensive Dharma practice. 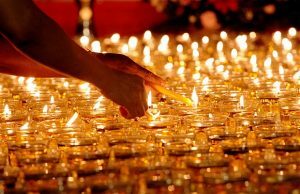 During this period, many Tibetan monasteries, including Kopan Monastery in Nepal, hold a Great Prayer Festival — Monlam Chenmo — for several days or even weeks during which the Sangha recite prayers from morning until evening. This year, Losar falls on February 5. The Fifteen Days of Miracles continue through Chötrul Düchen on February 19. All fifteen days are merit multiplying days, when the merit of virtuous actions performed, is multiplied by 100 million, as cited by Lama Zopa Rinpoche from the vinaya text Treasure of Quotations and Logic. 1pm Filling of extensive water bowls.